Custom printed double wall disposable coffee cups 240 mL and 360 mL. You want people to remember your business and if you’re going to supply cups to your customers – make sure that it’s got your brand on them! Our paper cups are double wall. Ideal for hot or cold beverages. Usually Shipped 7-10 days from approved artwork. Semi-Gloss finish with full colour process print. Available in multiples of 500 cups. 240 mL (8 oz) or 360 mL (12 oz). Lids are extra. When you’re providing coffee at an event, people will be lining up to come and see you! BUT … to be honest – it only gets you half way there. It’s not until you add branding to your paper cups that the real magic happens! 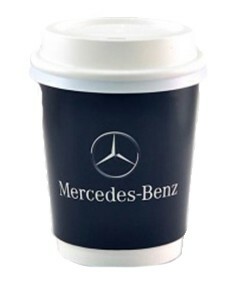 Branded paper cups are highly visible mini-billboards making their way around the event in the hands of the consumers, subtly letting others know where they can get some coffee as well, and by the magic of that ‘feel-good experience’ coffee brings people – it’ll have them looking for your business! When that first sip of coffee hits the pleasure-centre of your customer’s brain – and they look down and see your brand – that’s a serious win for your business! Customers will keep your cups in their hand for an average of 15mins at the event and the branding will literally be under their noses all that time! If you can see the magic of combining coffee with your own branded paper cups just click contact us and ask for a quote! We also supply plain cups but having your brand on the cup is well worth the extra cost. 8oz cups are the most common ‘standard’ size throughout Australia. Having said that, we have found in some regional areas that a 12oz cup is more likely to be considered a ‘standard’ size. 8oz cups aren’t going to cost you extra in coffee and milk that larger sizes will. Barista’s can make 8oz drinks faster and be quicker to serve your customers. Double wall paper cups aren’t going to have your customers feeling like their hands are burning! Many conference centres won’t allow single wall cups due to Health and Safety concerns for the consumers. Contact us for a quote now. We generally respond within 30 minutes!